This weekend, something big happened. 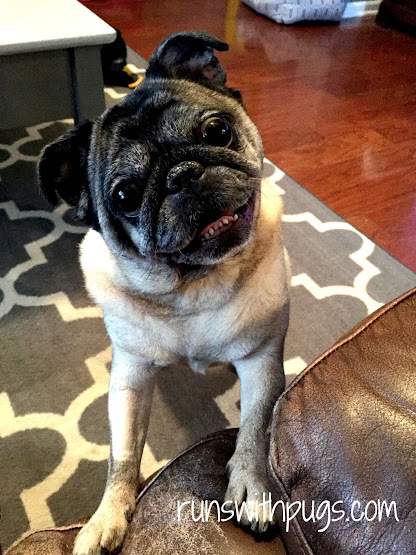 When our sweet boy Oscar passed over the Rainbow Bridge, we agreed that we would give it some time before deciding to add another pug to our family. 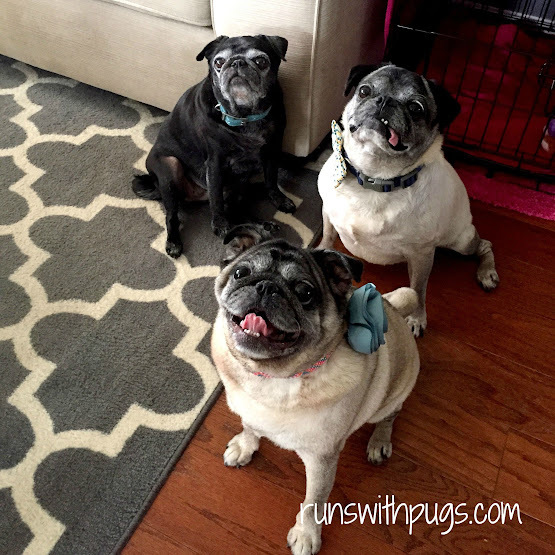 At the start of the summer, we attended a pug rescue event and invited the local coordinator into our house for a home check and review. We inquired about a few different dogs and there were a few disappointments, but last week, the coordinator made the call for which we had been waiting. She had a dog. For us. We had been hopeful for a female between the ages of three and five with an even temperament who was comfortable with children and other dogs. We were not picky about size or color, setting our focus on personality and being a perfect fit. We met her two Sundays ago, and she was very mellow and comfortable. She made herself right at home without much fuss, and it was pretty much love at first sight. Little man adored her and even Mr PugRunner seemed charmed. We agreed to wait for her to get her necessary dental and her bloodwork results and make a decision from there. Everything came back clear, our vet reviewed the results and gave his blessing, and we were good to go. On Friday, we took little man to the store and picked up a new crate with bedding, a couple of toys and new harness, collar and leash. And on Sunday, our new baby found her forever home. Without further ado, we are thrilled to introduce Delilah! She is about 4.5 years old and weighs in at a hefty 23 lbs. She has been on a rather strict diet (much to her chagrin) since she was taken in by the rescue. We think she had been getting quite a bit of table food because she is quite a chunk and is really less than interested in the zero grain kibble we have been offering (although she will deign to eat it when she gets hungry enough). When we first visited, she was rather quiet and seemed pretty content to just lay on the floor. However, after a few days here, her (incredibly sassy) personality is starting to shine. She is an absolute doll baby, and doesn’t mind being petted or picked up and snuggled. She loves to be close to us, and spends lots of time sleeping near our feet or in one of the dog beds. She is mouthy and bossy, and not at all shy. She is excited about EVERYTHING, and it’s so cute to see her tilt her head with her big eyes. Every day, at around 4:45, she starts to get super frisky and wants to play. It lasts about 20 minutes, but it makes her so happy to toss around a stuffed toy, and we love watching her have fun. She had her first bath here, and was a trooper. And she has also paid a visit to our vet to meet him and his staff (spoiler alert: they love her, and she seemed to love them, too). In addition to her weight issues, we are dealing with two different infections in both ears. We had them both cleaned and a cytology run, and not only is she on a round of medication to clear them up, but she will be getting her ears cleaned twice a week. Fortunately, it doesn’t seem to bother her. We also noticed that she has some scar tissue on one eye and her sight seems to be off. She gets around just fine, but she seems spooked by shadows an doesn’t always look directly at whoever is talking to her. 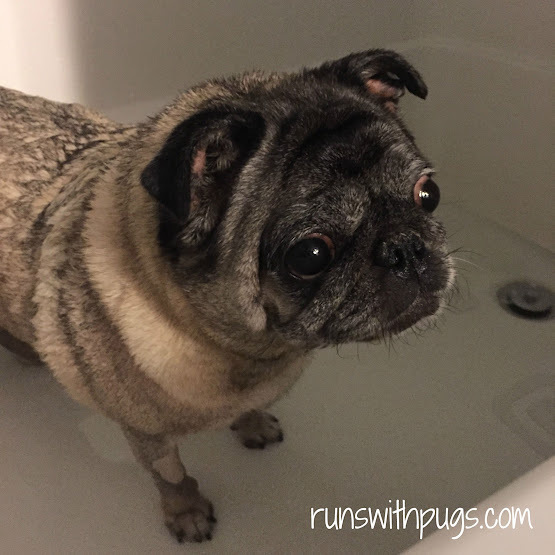 Pugs do tend to have trouble with their eyes, so it’s not a huge issue, but we will have the vet take a look at her ear follow up just to make sure there’s nothing more major going on. Little man adores her. He walks her to the bus stop each day, and she is so happy to be with him. She is the perfect compliment to our family, and Molly and Bentley have been so accepting of her. Molly even lets Delilah sleep in her beds (which she does not permit Bentley to do). Maybe she was just waiting for a sister. Frugal Beautiful hosted an amazing Virtual Pug Run 1 Mile/5K/10K last year, and of course, I had to join in the fun to earn my sparkly pugicorn medal. 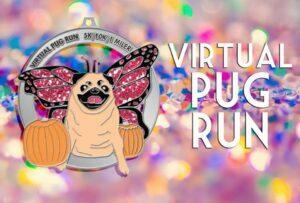 This year, she is back at it, with another Virtual Pug Run 1 Mile/5K/10K and puggerfly bling! So I registered for the 10K distance, to earn this adorable medal and to help out the Northern Illinois Pug Rescue. I have limited my virtual races to just a couple of events per year, but this one is absolutely worth it. 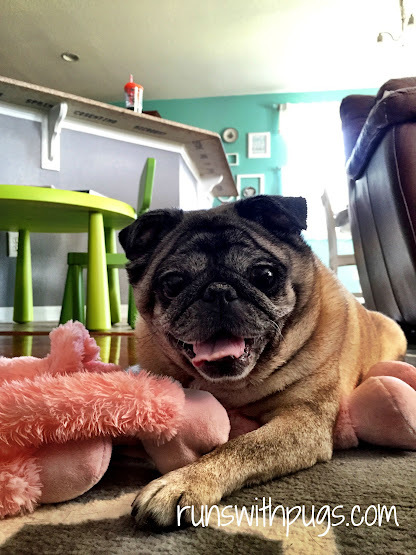 Delilah isn’t from Northern Illinois Pug Rescue, but I am happy to support any organization that helps sweet pugs find their forever homes. 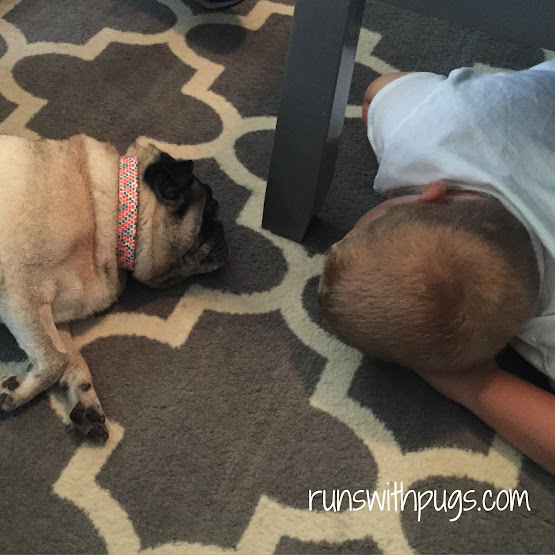 Will you be joining me and Frugal Beautiful with the Virtual Pug Run? My favorite post EVER! Hi Delilah!!!! I’m so excited for you all!!! We have turkey and sweet potato, and she’s really not too excited about it. She will figure it out, but I feel bad for her. She looks so betrayed when I put her bowl down. But yes, it’s been amazing. She is just the right amount of sweet and sassy and brings a little excitement to the house! I’m so excited for this particular virtual! I’ve tried to cut back because there are so many live races I want to run in person, but I couldn’t resist! Aww look at your little furry family. So adorable! Great to hear that you adopted and know the little one has a good home now. lacey@fairytalesandfitness.com recently posted…Beach Body Help Needed! She certainly does and seems to be fitting right in! It is so kind of you you adopted!I am a pug fun they make me smile! Ha! That’s why I have never put in to foster. I get attached almost immediately! Aww that’s so awesome that you adopted her! She’s soooo cute! We’ve adopted all of our pets…I’ll never get a dog or cat any other way. She looks like she fits right in with your pack! 🙂 It felt like the right thing to do. Molly was from a family breeder (they owned mom and dad as pets and had one litter because they wanted a couple of puppies in their home as pets), and Bentley was a rescue in that a friend of a friend knew someone who didn’t want him anymore and we took him so he wouldn’t go to a shelter.This is the first time we’ve done an official rescue and I am glad it is working out so well. I would totally get another puppy (the smell of puppy ears does to me what the smell of baby head does to seemingly every other woman on the planet), but for now, this was a good choice. Oh my goodness she is freaking adorable. She really is. She is always so excited looking, too, which add to the cute factor. Isn’t she the sweetest? We are so glad to have her here.